We are honored to accompany you as you plan for the funeral of your loved one. You can arrange funeral and memorial services by contacting the church office at 781-444-1469 and asking to speak with one of the clergy. The officiating priest will work with you and your family to select meaningful readings and music (within the framework of The Book of Common Prayer). You may choose to hold the funeral in the main sanctuary or the smaller chapel, depending on the size of the service. Our Sanctuary Garden was created as an area for the ashes of beloved members of Christ Church who have died. In the garden, visitors will find inviting benches set among a variety of trees, ornamental shrubs, flowering plants and a bubbling fountain. 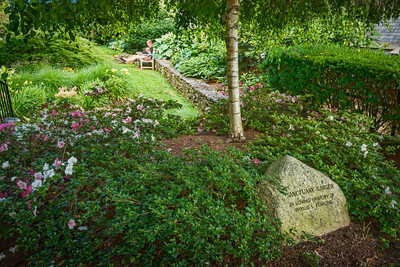 Visitors find that the natural beauty of the garden creates a peaceful environment to rest, reflect and pray for a loved one. Learn more about the Sanctuary Garden.